Happy Super Bowl Sunday friends!! It’s like Christmas Day! I love the pomp and circumstance that comes with Super Bowl Sunday – good food, good drinks, good company and some damn good football!. I’m headed to a friends house shortly to make an imprint on her couch with my body for the next 8 hours. Who are you rooting for today? I’m a big Patriots fan, especially this time of year – I mean, who doesn’t love Tom Brady right? I am beyond excited for Lady Gaga – she is going to CRUSH it – last years half-time show was such a let down too! Sure Beyonce was amazing, but thats about it! 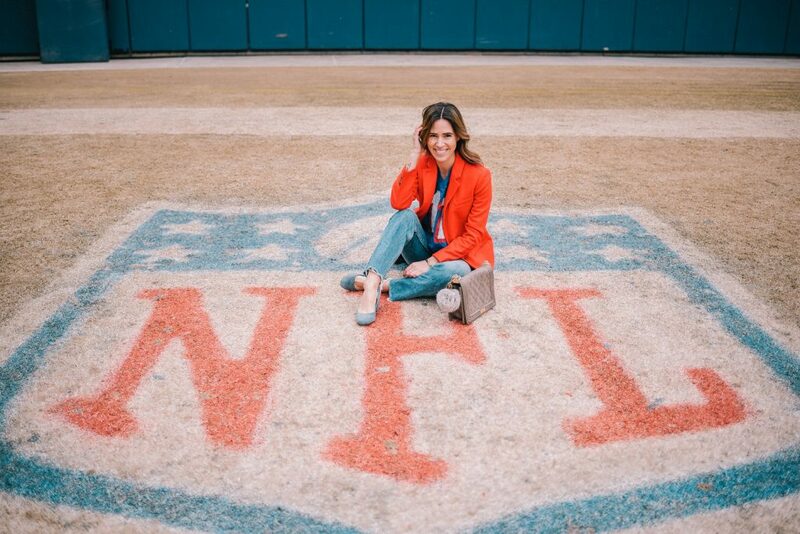 Today I’m sharing a quick 2017 Super Bowl Fashion look along with some last minute tips on Super Bowl hosting – guaranteed to impress you guests! Patriots Jersey – I love finding vintages pieces on Etsy! I bought this jersey a few years back and love it! H&M Denim – I die for these high-waisted Mom Jeans. I wear them with EVERYTHING! Red Coat – A statement coat in a bright color goes a long way during the winter! Blue Suede Pumps c/o – These Naturalizer pumps are SO comfortable! They are great for spring and perfect for game days! Wishing you all a fabulous Super Bowl Sunday! I hope it’s filled with tons of cheat food, Bloody Mary’s and 7 layer dips! 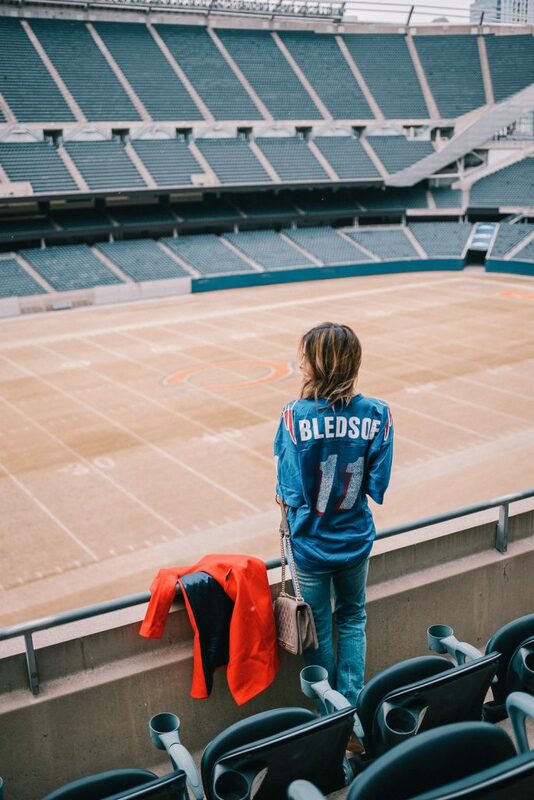 Ill be rocking this SAME exact Super Bowl Fashion look – I wore this jersey a few years back when the Patriots played….and won might I add. I’m happy to be their little good luck charm from afar! For more hosting tips and game day recipes, check out the post I did this week with The RoomPlace here – so many fun, and easy, DIY tips to turn your house in to a stadium affair! Hiya, I am really glad I have found this information. Nowadays bloggers publish only about gossip and web stuff and this is actually frustrating. A good site with exciting content, this is what I need. Thank you for making this site, and I will be visiting again. Do you do newsletters by email?